Victory Fighting Championship is the premier MMA organization in the Midwest…and also one of Special Olympics Nebraska’s strongest supporters. 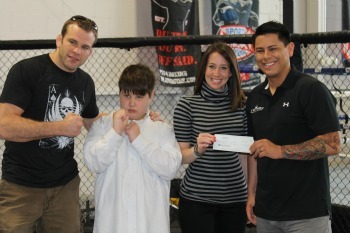 In the course of one year, Victory Fighting has donated over $5,000 in proceeds from their events to our athletes. Victory Fighting President Ryan Stoddard says they chose to partner with Special Olympics Nebraska because they find a connection to our mission. “We are proud to partner with Special Olympics Nebraska because we see the beauty in what Special Olympics athletes do every day and what our athletes do every day. This partnership just makes sense for us,” Stoddard said. Stoddard said MMA fighters and Special Olympics Nebraska athletes aren’t that different from each other. The next Victory Fighting Championship event will be December 14th, and marks the one year anniversary of the partnership with Special Olympics Nebraska and the Ralston Arena. Stoddard said they are hoping to set an attendance record at this fight, allowing them to donate more money to Special Olympics Nebraska. The fight card boasts heavy-hitting names like former UFC champion Josh Neer, and local heroes Jason Brillz and Drew Dober. So what can a first timer expect at a Victory Fighting event? “Great atmosphere, great entertainment and family-friendly environment! We’re all about the bright lights and big fights!” said Stoddard.